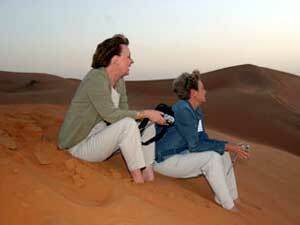 Mary Martin Venker and Diana Ryrholm Geerdes enjoy the sunset view from atop a dune in the Rub 'al-Khali at Shaybah. DHAHRAN, SAUDI ARABIA (March 09, 2005) - If good international relationships are developed on good individual relationships, the 70-year-plus ties between the United States and Saudi Arabia would seem to be in good shape after an eight-day visit of 12 retired Saudi Aramco employees and family members that ended March 5. Their visit, sponsored by the National Council on U.S.-Arab Relations and Saudi Aramco, included a 3-1/2 day tour of Saudi Aramco facilities in the Eastern Province. Throughout the retirees' travels, they took advantage of every opportunity to learn, rekindle old memories and renew longtime friendships. John D. Anthony of the National Council on U.S.-Arab Relations accompanied the visitors to Riyadh and Jiddah. In the Eastern Province, the delegation kept up an active pace, visiting the EXPEC Computer Center and 3D Visualization Center, the Heritage Gallery's "Traditional Bedouin Life and Desert Lore" exhibit, the Saudi Aramco Exhibit and former community and work sites. There were receptions and meals hosted by executives such as president and CEO Abdallah S. Jum'ah, and a tour of the remote desert oil facility of Shaybah in the Rub' al-Khali (Empty Quarter), where guests enjoyed a hearty Arabic-style dinner in a tent overlooking the Shaybah complex. Bert Golding is greeted by EXPEC Computer Center manager Ahmed A. Metwalli as a group of retired American employees visited Saudi Aramco facilities. The "homecoming" by Saudi Aramco alumni was part goodwill mission. The participants were selected because of the roles they have played in their communities, bringing a view of the Middle East that comes from having lived and worked here. Marland Townsend and his wife, Marlyn, live in Foster City, California, where he has twice been elected mayor and has served on city council for 12 years. Bill and Karen Irwin of Delafield, Wisconsin, group leaders for the trip, have both given presentations about Saudi Arabia to civic, social and church groups. For the Irwins, the trip was an exciting opportunity to get updated information about Saudi Arabia to be able to "stand on solid footing when speaking." Karen believes her role "as a sort of unofficial ambassador is important because there is so much misinformation circulating that needs correcting." Having visited 110 countries, Sue Koenig, upon retirement, realized her dream in 1996 of opening a museum in Arkansas called Window to the World. The museum offered visitors opportunities to "tour" and experience the world, and contained an especially large Middle Eastern area. She moved the museum in 2000 to Colorado. In the past nine years, more than 75,000 people have visited her museum, which is now looking for a new home. 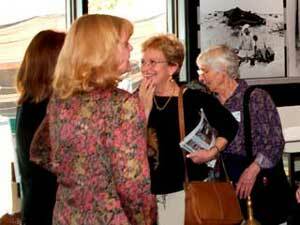 Karen Irwin, center, and Joan Golding, right, chat with Heritage Gallery staff. Mary Martin Venker was born in Dhahran. Now a resident of Charlotte, North Carolina, she has been a presenter, talking about her experiences growing up in Saudi Arabia to the philanthropic PEO Sorority, book clubs and church groups in the Charlotte area. Bert Golding is a member of the American-Arab Anti-Discrimination Committee of Houston and the Arab American Cultural and Community Center of Houston, as well as a long-time member of Americans for Middle East Understanding and of the Council for the National Interest. He often provides background info on Saudi Arabia and on the oil industry to local groups. Mark Mowbray also was born in Dhahran. While working as a general assignment reporter in Knoxville, Tennessee, for three years, he worked to bring a more accurate representation of the people in the Middle East. Bert Golding's wife, Joan, until now has gotten most of her knowledge of Saudi Arabia from her husband of 19 years. "Saudi Arabia has so much to offer the world," she said during her first trip to the Kingdom. "I will try to take every opportunity to tell people about this beautiful country." Marlyn Townsend, who as a supervisor of the Hamilton House Executive Guest Facilities in the late 1980s helped organize receptions for three royal visits to Saudi Aramco, said, "You don't realize what an impact this place has had in your life until you leave and come back." she said the friendships, lifestyle and cultural experiences have had an irreplaceable impact on her life. For all of the visitors, their trip reinforced their positive perceptions of the Kingdom and the company, of their growth and development. 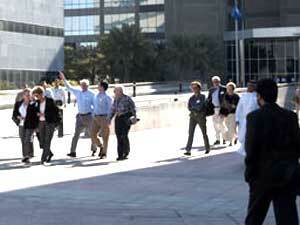 The visiting retirees make their way through the Dhahran Core Area. Diana Ryrholm Geerdes is serving her second term as president of AramcoBrats Inc., which now has more than 4,500 people in its database. "Arab hospitality has not changed," said the daughter of Robert W. Ryrholm, now deceased, who was with the company from 1949 until he retired in 1977. "We have been shown incredible kindness and generosity. That has truly impressed me." Geerdes, who does a lot of volunteer work in her hometown of San Diego, California, said she appreciates the gift of a childhood in Saudi Arabia and will always share her favorable memories and impressions. 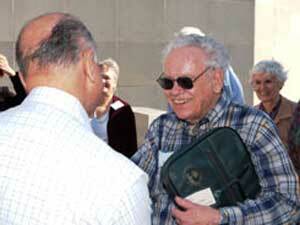 Bert Golding began his 29-year career with Saudi Aramco in 1956. In 1982, he was placed on special assignment as project coordinator for the EXPEC Computer Center. When the center was completed, he remained there until he retired in 1985. For Bert, the highlight of the trip was seeing the EXPEC building. He said it was "unbelievable" to see the "tremendous computing power of the center." Mowbray said the Saudi people have done a great job of accepting technological advances while not losing their culture and heritage. For Bill Irwin, it was great visiting with many of his Saudi friends who have now taken leadership positions within the company. He called Shaybah "fantastic" and was amazed to see all of the Saudis in leadership there. "The company should be very proud of them," he said. "They really know what they are doing." All of the participants were grateful for the opportunity to return to Saudi Arabia and expressed their thanks to Saudi Aramco management for their hospitality and generosity.